In 2015, Parramatta FutureCampus has had the pleasure of hosting a weekly CoderDojo at our facility. 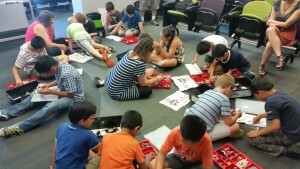 The 17 kids, and their parents, who attended recently had a fantastic time building Mindstorm robots and programming them, and the resulting Sumo comp was, we heard, very exciting! FutureCampus has been thrilled by the high attendance numbers and the chance to provide future students with the chance to explore the fascinating world of Computer Science and programming. The workshop was also attended by ‘Robogals’ from UNSW, an international, not-for-profit, student-run organisation that aims to increase female participation in Engineering, Science and Technology through fun and educational initiatives such as this workshop. While Robogals primarily aims at increasing female student numbers in STEM studies, they certainly found all the participants were ‘creatively inquisitive’. As you can see from the photos, the event was fun, educational and a great example of FutureCampus working with our community to lead the way forward in education and learning. Stay tuned for the next time Robots take over!